Ica Icarette 1 (A) – John's Cameras. This is an Icarette camera made by Ica in Dresden, Germany. It is a model 1 which was introduced in 1912 but I cannot tell if it is a type 495 (the original, model A in the USA) or type 496 (later version that can also take glass plates, model B in the USA). Ica was a camera manufacturer based in Dresden and owned by the Carl Zeiss Stiftung. Ica is an acronym for Internationale Camera Aktien Gesellschaft (the Aktien Gesellschaft part is the German equivalent of the British ‘PLC’ or USian ‘Inc’). Ica is one of the companies that merged to form Zeiss Ikon in 1926. After 1926, Zeiss Ikon continued to make Icarette cameras but this one is clearly marked ‘ICA Akl Ges’ (the usual abbreviation is AG rather than Akl Ges). This means it was made prior to 1926. I can date it more accurately (but not very accurately) by the Body Number (E42012). In 1926 when the merger to form Zeiss Ikon occurred, Ica were up to the letter ‘L’. For each letter, Ica made 100,000 cameras so the seven letter difference indicates 700,000 cameras. 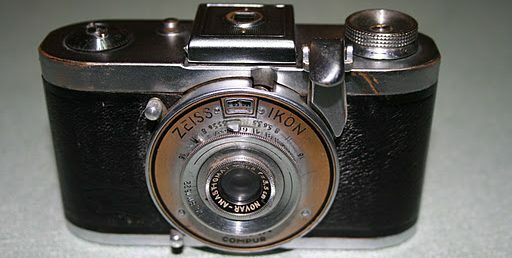 After the merger into Zeiss Ikon, production by the much larger business only used two letters of the alphabet each year. The smaller Ica, which was also trading during a much tougher time, is unlikely to have used more than one letter each year which pushes the date of this camera back to 1919 at a best guess. I can also date the lens which was made in 1918. Lenses were made in batches and one batch could last serveral months and it is not unusual for manufacturers to use a lens in the year following the manufacture. The Icarette model was introduced in 1912 so a date of early 1919 (or perhaps late 1918) is more than reasonable. Further research leads me to believe that the ‘E’ serial number is likely to be 1915 rather than 1919. My dating for the lens was based on my assumption that a Novar lens with a serial number would have been made by Carl Zeiss and so that I could date this lens by the serial number. I no longer think that this is so. Other owners of Ica cameras have better dating due to their cameras having Tessar lenses and equating the Tessar serial number with well established dates with the Ica body number gives me a much earlier date for this camera. I also have a later Icarette made in about 1930 by Zeiss Ikon. My particular camera has been ‘well loved’. Although it has the signs of having been used well, it is in quite good condition for a camera that is 100-odd years old. The main defects are: someone has attempted to remove the rear element of the lens. The metal of the securing ring has gouge marks and there are significant scratches to the matt black paint in the area around the lens. The front two elements of the lens are also loose-ish – loose enough to remove by hand. The inside of the back has been repainted in places by hand and someone has added a home-made catch for the lens board. Wear and tear includes the leather (not leatherette) covering starting to peel and fray at the edges in places. The steel parts have some surface rusting. Someone has removed the wire frame from the viewfinder. The only other significant defect I can find is the locating pin for the lens standard. On opening the camera, it is necessary to pull the lens forward by squeezing the two plated lugs below the lens. The lens then pulls forward on plated rails until it locates on the pin mentioned above. This pin is visibly worn and no longer locates the lens standard properly. Rear view of the inside. I shall now give a general description of the camera. It measures 125 mm by 80 mm by 30 mm when closed (by 90 mm when open). It weighs 370g. The lens board is central on the front and opens downwards. The outside of the camera is very plain. It is entirely covered in black leather which is minimally decorated with straight line tooling. The top of the camera has the film advance knob on the left. While the back is on the camera, this is securely held in place. Once the back is removed, the advance knob pulls upwards to release the take-up spool. On my camera, the advance knob becomes completely detached but I am not sure this is as it should be. The knob locates with two pins – one short and one long (6 mm and 33 mm, respectively). The long pin has a flattened part half way along. Inside the camera, besides where the spool goes, is a small hole that aligns with the flattened part of the long pin. I suspect that this hole once contained a screw that allowed the long pin to move the length of the flattened part and no further – about 5 mm. The knob itself contains a ratchet so that the knob cannot turn the wrong way and loosen the film on the spool. The back of the camera has a red window placed centrally. The camera takes 6 x 6 cm photographs and so uses the middle row of numbers on the film’s backing paper. The film size is 117 (now obsolete) which is the same size film as 120 but on a smaller spool – a bit like 620 film. 117 has essentially the same size spool as 620 but uses the 120 size key-hole on the end of the spool, rather than the smaller 620 key-hole. I could (but won’t) rewind some 120 film onto the spool that came with this camera and use it. As this camera has a focussing issue, I shall not bother. Using the rear viewfinder window. When the viewfinder window is all the way down (in the closed position) it covers the red window and prevents any light getting into the camera and fogging the film. To wind-on the film, you raise the viewfinder part-way to expose the red window. When taking a photograph, you raise the viewfinder all the way, covering the red window again. Ingenious! In order to load the camera with film, the back must be completely removed. This is done by depressing two plated studs on the right-hand end of the camera. The front of the camera opens downwards and fits into place with a definite click. In the face of the lens board is a tripod boss. As I mentioned, the lens must be pulled forwards until it locates on a pin to keep it in the correct position. The lens is attached to the body with leatherette bellows. These seem to be in good condition with no visible holes or splits. Focussing is achieved by moving a lever on the lens board which moves the shutter/lens forwards and backwards. Focussing with this camera is not critical – the distance on the scale between infinity and one metre is about one cm. The lens is a 75 mm Novar lens (inscribed as being 7.5 cm, as was the fashion pre-WWII). It has a maximum aperture of f/6.8 and a minimum aperture of f/36. The sequence of apertures is not the modern one. It goes: 6.8, 9, 12.5, 18, 25, 36. These numbers are very hard to read as they are behind the mount for the Iconometer viewfinder. The shutter has no name or other identifying marks but it is either a Gauthier Derval shutter or an Ica Automat X shutter I think it is probably an Ica Automat X Shutter. It has two blades only and offers 1/25, 1/50 and 1/100 speeds as well as B and Z. Z (marked as T on export models) opens the shutter which then stays open until the release lever is pressed a second time. There is a threaded socket for a standard cable release. On the left side of the shutter housing is a Brilliant viewfinder. It was normal at this time to offer two finders – a brilliant and a frame finder. This Brilliant finder is in remarkable condition. the mirror in brilliant finders seem to be plated straight onto steel and in old cameras is usually corroded enough to make using the finder very hard to use. This one is quite usable. The top of the shutter housing is supposed to mount the wire frame part of the other viewfinder (called an Iconometer by Ica). The mounting is still there but the frame is missing. The shutter is made with a sideways movement of 8 mm either side of central – a total movement of 16 mm. I think that this is for when you use the camera in portrait format to photograph buildings. The vertical shifts of lenses reduces/removes perspective problems in architectural photography.